Gillen McAllister from Sony has today taken to the official PlayStation blog to reveal more details about the virtual reality experiences including the PlayStation version of the latest tomb Raider game, Rise of the Tomb Raider. McAllister explains a little more about what you can expect from the virtually reality experience included in the latest to make the game which is now available to purchase on PC, PlayStation 4 and Xbox One. We’re standing a few feet inside Croft Manor’s wine cellar and are hesitant to move another step. Our surroundings are dank, dark. A small window at the corridor’s end fails to illuminate the bowels of Lara’s childhood home. Shadows and cobwebs are everywhere. A shiver involuntarily runs down our spine. Truthfully? We’re a little scared. Such is the immersive power of PlayStation VR. We’re testing out the headline feature of Rise of the Tomb Raider ahead of release: 10 minutes to explore Croft Manor, Lara’s childhood home. 10 criminally short minutes to experience the franchise in a wholly new way. Chronologically positioned part-way through the main story and selectable as one of a handful of additional extras from the main menu, this side-quest sees Lara returning home to unravel a family mystery. 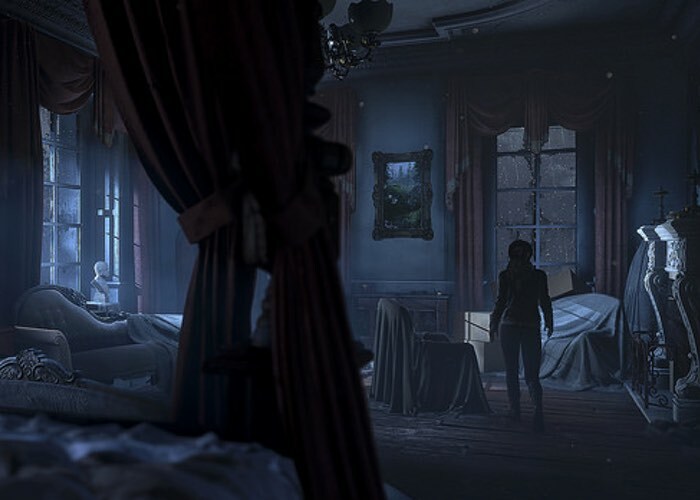 Croft needs to explore her surroundings, piece together clues, and uncover secrets to learn how to reclaim the dilapidated Croft Manor as her own. For the full article jump over to the official PlayStation blog via the link below.